A man pruning trees owes his life to the fact that he was wearing a harness with short lanyard while working from a spider type boom lift. 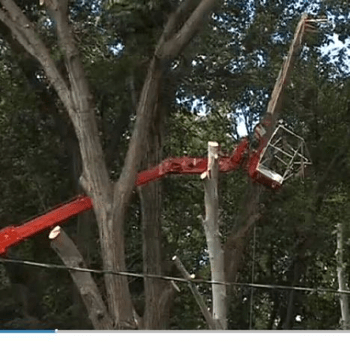 The man was catapulted out of the lift – a 24 metre CMC spider lift – he was using on Wednesday afternoon, in Longmeadow, Massachusetts, after the limb he was cutting split and crashed down onto the boom, causing the catapult effect. He was left dangling from the platform in his harness around 20 metres up in the air. The man, an employee of Tree 413, was rescued with the aid of ropes and taken to a local hospital where his condition was said to be non life threatening.